Tactic: Use the “Matched on LinkedIn?” search filter to see your where EverTrue is pulling in information from LinkedIn for your constituents. 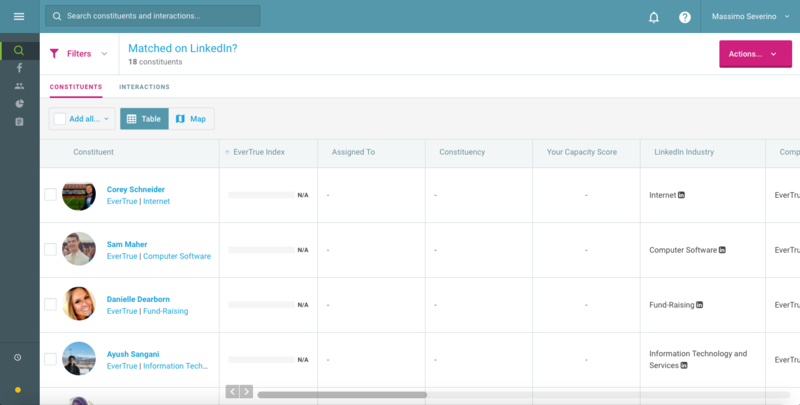 EverTrue allows you to see current employment information from LinkedIn. Run a search for specific groups of alumni or parents (i.e. by graduation year) and add a “Matched on LinkedIn” filter. By our estimates, upward of 60% of alumni career information is outdated in school databases. By using this search in EverTrue, you’ll have a better view into where your alumni and parents work, which helps you organize networking opportunities, plan events, or create solicitations. When you see new information, reach out with a note or email to say congratulations! Results: Alumni who feel connected to their school and valued as they progress in their career.